We have some great new products in our Golf Department here at Calendar Lady Promotions for all you budding golfers and golf club owners. Our Company Three in One Golf Brush Tools are a special tool to help you with your game including a brush to help you clean your brushes, a pitch fork and a ball marker to mark your ball on the green. So help to keep your business details advertised upon our Company Three in One Golf Brush Tools today and stay advertised. To find out more about our Company Three in One Golf Brush Tools click here and fill in the contact form and we'll get straight back to you. 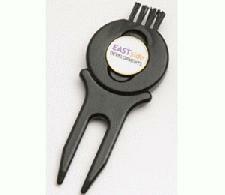 Other promotional and personalised items besides our Company Three in One Golf Brush Tools click here.